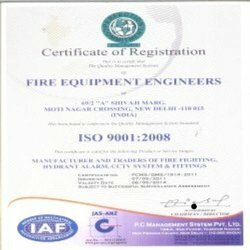 We, Fire Equipment Engineers, is an ISO 9001:2008 certified organization, which was incepted in 1999. Engaged in the manufacturing, trading and supplying of an ample and qualitative range of fire accessories and safety equipments, we are a trusted name in the market. We also provide fire extinguishers refiling servicesto our clients. The extensive range of products offered by us is inclusive of Boom Barrier, Fire Extinguisher, CCTV Cameras & Safety Equipment. Owing to their accuracy, fine finish, and durability, these offered products are widely considered among the client-base we have accomplished to gain. Confiding on the credible vendors for the high grade raw materials, we ensure an utmost quality of the whole range of the products offered by us. These products are manufactured under the stringent supervision of the professionals and experts, who further ensure a qualitative range of products. The optimum quality of the products we offer has amassed words of immense praise among the revered client-base, we have reaped so far. Driven by a client-centric approach, we have earned a desired goodwill in the market. Under the mentorship of Mr. Vineet Mehrotra, we have developed a strong foothold in the industry. His leadership qualities and intense experience in the domain has enabled us enables us earn our name in the market. Attributing to his able guidance and fair business practices that we follow, we have attained the trust of our prestigious clients spread across the nation. We are a highly acclaimed name to offer an extensive and qualitative range of fire accessories and equipments. Aided with a dexterous team and a sophisticated infrastructure facility, we are capable of offering a range of optimum quality to our respected clients. The team of experts we have further ensures an accolade range of products for our customers.